My lower engine wires, that are original, are looking a bit crispy. Found the nice kit Wilcox has. Question is do I have to dig into, any under dash stuff or is it all just under the hood. Where does it start, does it just plug to a block and thats it and then route everything. Just debating the amount of work. the ign harness and the headlight harness clip together and then bolt into the back of the fuse block on the engine firewall side. it's all down low under the brake booster and steering joint where it exits the firewall. mine was covered in the bituminous tar like sealant, had to scrap away until i found the bolt. Its one of the easier jobs....doesn't take long either. It starts at the junction block shown below.. or what is called the bulkhead connector. Remove the bolt from the firewall shown below, the pull the two harness's from the firewall. Then pry the two part for replacement. Once you have the two separated, its pretty much plug and play. Last edited by Willcox Corvette; 02-25-2016 at 11:45 AM. 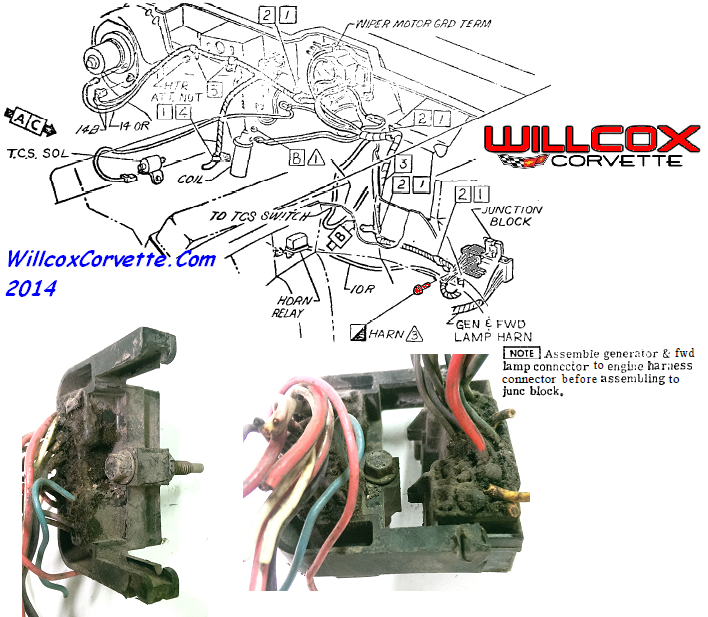 BUY the harness from Wilcox....its Lectric Limited, they have better pricing on them than you could get by buying into Lectric Limited for a $5K dealer order. Thanks Wilcox! Awesome guys Thanks! Good to be back under the car and on the forum! Will do, on the Wilcox harness. Thanks for the diagram that's what I wanted to see.